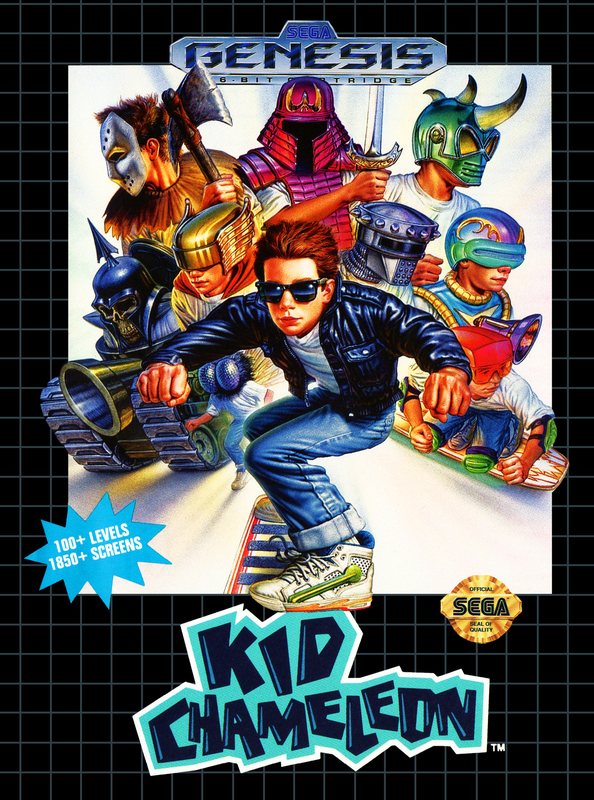 Mention of the name “Kid Chameleon” to most classic gamers will typically be met with a shrug of casual indifference. The game has been included on a number of Sega Genesis compilations over the years, so most gamers have been exposed to it at some point but haven’t played it enough to form a strong opinion about it. In most cases the first level is sampled briefly, but many are immediately put off by the generic art design of the main character. Aside from the lackluster character design, the game can initially come off as a shameless Mario clone, but what most gamers fail to realize is that they’re making an unfortunate mistake by not giving this game a fair shake. It’s easy to cast KC aside if you only played the game for 10 minutes, but play the game for a couple of hours and you’ll have a completely different impression of it. In fact, you’ll likely realize that while this game is most definitely a Mario clone, it’s a damned good one. Sega had been looking for a game to go head to head with the Super Mario Bros. series for a very long time. Since the release of the original SMB on the Nintendo Entertainment System, they had looked for a character that could duplicate Mario’s widespread appeal as a mascot for their video game brand. Alex Kidd seemed to be the “kid” for the job, and he was featured in a number of Master System games, as well as Alex Kidd in the Enchanted Castle, an early Genesis release. Sega didn’t find their true Mario until the arrival of Sonic The Hedgehog in 1991. Although the Sonic character was worthy of being Sega’s answer to Nintendo’s mustachioed plumber, the gameplay of the first Sonic The Hedgehog game was actually quite different than Nintendo’s masterpiece. Super Mario Bros. was based around exploring levels and discovering secrets, while Sonic was about pure speed. As wildly successful as the first Sonic game was, you’d think that Sega would also want a platformer that had gameplay more comparable to SMB. Luckily, Sega Technical Institute’s first game would fit the bill nicely. Sega Technical Institute (STI) is better known as the developer that helped Sonic Team design Sonic The Hedgehog 2, widely considered to be the best Sonic game of all time. However the first game to come from STI founder Mark Cerny was Kid Chameleon. Kid Chameleon is essentially a Mario clone, but with some important differences. In Super Mario World, Mario has 2 major power-ups; the ability to shoot fire balls and the ability to fly. KC has quite a few more abilities. 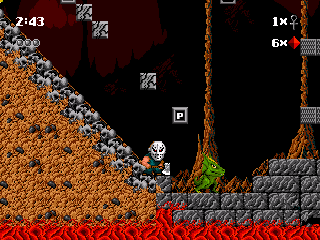 He starts out as the standard tough kid character, but as he finds various masks hidden in blocks (similar to Mario’s mushrooms), he can transform into 9 different characters. This makes for some interesting and varied game mechanics, which is critical because the game features 103 levels and almost 2,000 different screens, and is therefore not a short platforming romp by any stretch of the imagination. One big negative for KC is the lack of a save system. You would think it would have a password save system at the very least, but alas that is not the case. If you’re using a real Genesis console rather than an emulator with save states, be prepared to leave your Genny running for multiple days if you want to beat this game from beginning to end. The sights and sounds of KC aren’t exactly going to give Gunstar Heroes a run for it’s money, but this was an early Genesis effort, so it’s somewhat understandable. Also, considering the length of the game, you can’t really knock the developers for not having the most impressive visuals and sounds. It’s not a repulsive game by any means, but you don’t get the same graphical flair that came with STI’s second effort, Sonic 2. Minimal parallax scrolling is used and the art leaves much to be desired. The game actually looks like it could have been done on the TurboGrafx-16. Still, the lack of visual splendor never bothered me while playing the game. I was too caught up in the level design and unique platforming gameplay. The sound design was also mostly fair to middling. The background music doesn’t have any particularly memorable tunes, and the sound effects are more passable than spectacular. 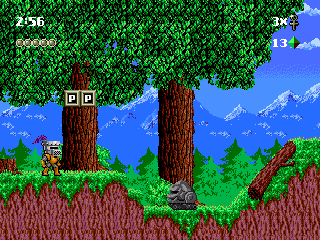 The true star of Kid Chameleon is the level design, and the unique gameplay created by the ability to transform into 9 distinct characters. In the first couple of levels nothing really stands out in terms of level design, but as you get a bit further into it you start to see STI’s grand design for the game. The levels start to get a bit more intricate and clever, and it requires the player to choose wisely in terms of which of the 9 personas to turn into. At one point in a particular level, you’ll need to start out as the “Berzerker”, a rhino-style character that can blast through certain blocks. Then you’ll quickly have to switch to the “Iron Knight” character to be able to scale the side of a mountain. Next you’ll need to quickly become the “Red Stealth”, a samurai warrior with a sword, to battle some enemies, and finally back to the Berzerker to blast through a barrier. It’s this kind of on the fly micro managing of your abilities, along with the inventive level design that elevates Kid Chameleon to the status of a poor man’s Super Mario World. While KC isn’t going to be finding itself in the top 10 of any “Greatest Video Games of All-Time” lists like SMW does on a regular basis, this overlooked Genesis platformer should find itself on the list of the 50 Best Genesis Games and should definitely find it’s way into your Genesis cartridge slot. Buy Kid Chameleon on GameGavel or Amazon. A chronic early-adopter, Anthony Norcia brings the experience of someone who owned nearly every gaming console on the day of its release. Also a home theater hobbyist, Anthony enjoys finding new ways to enjoy his classic games with the highest-possible video and audio quality. Although he still plays his share of classic games, Anthony is also well-versed on the modern consoles of the day. Tagged genesis, Kid Chameleon, mega drive, Retrospective, sega. Bookmark the permalink.